ToposPro software is free for non-commercial use. If you are going to use ToposPro for commercial purposes you have to buy a license for commercial use. Windows 10, 8.1, 8, 7, Vista and XP. 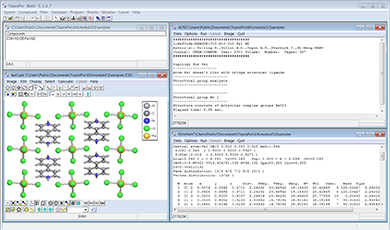 ToposPro is a program package for comprehensive analysis of geometrical and topological properties of periodic structures (crystals, networks, tilings). ToposPro was tailored to process large samples of crystallographic data and to find correlations between structure parameters. 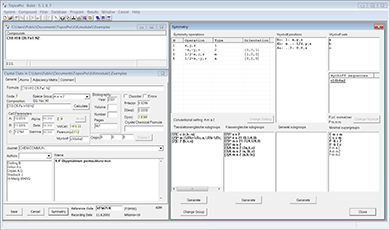 The ToposPro software includes Database Management System and a number of applied programs and procedures, many of which realize unique algorithms of crystal structure analysis. The ToposPro Topological Collections contain a large set of databases on geometrical and topological properties of atoms, molecules, structural units, periodic networks, tilings, entanglements, and other finite and infinite crystal architectures. With ToposPro you may explore any kind of crystal structure and solve many important tasks of crystal chemistry, structural chemistry, and materials science. This collection contains the information on topological types of simple periodic nets and finite graphs. This collection matches topological types of abstract nets and graphs collected in the TTD with examples of real crystal structures. This collection is based on the TTO collection and lists all ways of transformation from one net to another that are realized in crystal structures. This collection contains topological type samples of underlying nets obtained by simplification of 13,644 real crystal structures. This collection is a large database of molecules, their sizes, forms, and connection modes in crystals. This collection contains the data on chemical composition, topological structure and connection modes of polyshell nanoclusters in intermetallic compounds. This collection is a comprehensive storage of ligands and their coordination modes in mononuclear, polynuclear and polymeric coordination compounds.